This is the first CCNP TSHOOT Troubleshooting scenario based on the official Cisco CCNP TSHOOT topology. This lab is pre-configured and “broken” so you can learn how to troubleshoot a full network. Before you start with this lab I highly recommend you to study the topology, you can find the PDF in the attachments. Below you will find the troubleshooting tickets for you to solve! Everything is pre-configured for you. Do not use show run! (this will spoil the fun 🙂 use the appropiate ‘show’ and ‘debug’ commands. This will teach you the skills needed to become a true troubleshooting master. Ticket #1: One of the users was working on Client1 but he’s complaining that there is no connectivity. He left a comment that he saw a message on the windows taskbar that said something like “no network connectivity”. One of your colleagues looked into the problem and told you it had probably something to do with DHCP. Ticket #2: After fixing the issue with Client1 you receive another ticket that users from VLAN 10 are complaining that they are unable to connect to the FTP server. Ticket #3: Your users are happy that they can connect to the FTP server but they are still unable to reach the webserver. Ticket #4: The IPv6 team left a ticket for you that they are unable to reach 2026::12:/122 from DSW1 or DSW2. It took me 1000s of hours reading books and doing labs, making mistakes over and over again until I mastered all the troubleshooting issues for CCNP. Would you like to be a master of troubleshooting too? In a short time without having to read 900 page books or google the answers to your questions and browsing through forums? I collected all my knowledge and created a single ebook for you that has everything you need to know to become a master of troubleshooting. 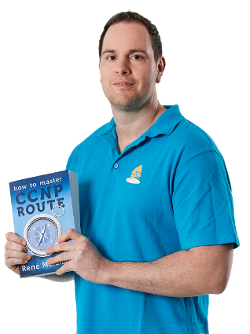 You will learn all the secrets about troubleshooting OSPF, EIGRP, BGP and everything else you learned for CCNP ROUTE and SWITCH. Rene,I think u forgot to share The Topology & Configs . i cannot find the configs for GNS3 either. Is this working for anyone out there ? Oh, I have been waiting for this!!! I’m sure since you just posted, that the things people are talking about are coming soon. This is great!! You know, I really don’t have a life, I just hang out here waiting for labs! Ha ha. The attachments are now here, I forgot to publish them (oops!). I think this lab will be great for learning how to troubleshoot. It’s more difficult than what you’ll have to do on the CCNP TSHOOT exam. I used for – c3725-adventerprisek9-mz.124-12 . after editing file topology.net, i got error "invalid destination interface"
I almost missed BGP on this one, I was going to create a default route to ISP until I looked at BGP as a routing protocol on R1! Thank you Rene, this was an incredible lab! I spent some time on it! I really feel more confident on getting my TSHOOT Cert. Rene is it legal to download the quick reference guide? Sure why not? Cisco offers it as a PDF file. Rene thanks a lot for these wonderful Labs, they are really helpful and they also test your networking understanding…..thanks once more. Thanks RENE, but it does not works on GNS3 windows, I’ve tried c3725-adventerprisek9-mz.124-12.bin. [color=gray]Thanks RENE, but it does not works on GNS3 windows, I’ve tried c3725-adventerprisek9-mz.124-12.bin. Reset error, lost communication with hypervisor? I start the final config, but the client can’t get the IP address from the DHCP server. It’s really strange for me. I can’t find the solution to fix it. I made the PART (you know why part) of this lab on Packet tracer and it’s working. Could you please check or explain why the client’can’t get the IP address. I could but there are many components in between that could cause the issue. What did you verify / exclude what the problem could be? You can also take a look at the sample of my TSHOOT book. You can read the chapter where I walk through the troubleshooting of this lab for free. Then I get the “connection lost” message and the topology doesn’t start. Any help would be great. Thanks. sparsemem = True for all routers. Not sure I follow, is that in the topology.net ? And, I am assuming that you are aware that I am doing this on a Mac. I added that line to my topology, see below comment where I subsequently added AFTER the idlepc value, on next line. I now just get "connection lost". This must be a hypervisor issue, but I cannot figure it out. So Rene was right again! I had duplicate aux ports int the topology.net file. Much better to run on gns3 for Mac than on gns3 for windows INSIDE vmware fusion! The lab has worked fine( only some edits are required in the .net file). Rene you are really a great guy. Now I am pretty confident that I will be able to nail down the CCNP THOOT EXAM in near future. Rene, thanks a lot for these superb labs. I’m using a mac. What edits would be recommended? I have never had to edit any other lab. This is the first that I have had issues with. I edited the topology.net. I now am getting an error in the console as follows. below the console error, I will show my corrections to the “.net” file. This is the only lab I have issues with. Please find the edited .net file.The fields to be edited are "workingdir" , "image", "idlepc", "console" & " aux " as per GNS3 config in your PC. text = "VLAN 20 – 10.2.2.0 /24"
text = "BGP AS 65002"
text = "VLAN 10 – 10.2.1.0 /24"
text = "BGP AS 65001"
Thanks, it was the aux ports, as you said. couple of comments. Everything on this lab is great! 1. It’d be fun to add the topo again with new problem tickets. 2. GNS3 doesn’t play with vlans well, or vtp so one has to use the vlan database to adjust that. 3.The L3 topology is mis-labeled between DSW1/DSW2 and R4. should be 10.1.4.4 and 10.1.4.8 /30 respectively. It"s my pleasure.Wish you all the best. You are going to have do some edits in textedit to the.net file. If you read my issues above, I had similar problems. I edited the aux ports to be different ports for each instance. There are other issues that you may need to address like the length of the file paths, no spaces in the paths. I’m assuming that you uncompressed the file like with other labs? Also, read online, once you get it going, that there are special ways of addressing the switching commands on GNS3. Good luck, once I got it to work on my Mac, I made excellent progress. Please advise on these errors trying to start the lab and unable to resolve this on my own.. I have read all the other comments and all aux ports do in fact have different numbers, but I am still getting the aux port already in use error. Any ideas? where can i find the tickets for the tshoot exam with complete questions? It’s been a while since I read the comments on this lab. It seems that the MAC has something running on the ports that GNS3 uses for AUX. You can change these. I also recommend to use the C3725 router and not the C3745, this might cause issues. In the future I’ll add more labs like this one, with new tickets to troublshoot. Thanks Rene – these labs are just what i was looking for. Tshoot is a funny exam to prep for as you really need broken labs to start with, not build them fro scratch like you do for route & switch. You are welcome. Linux shouldn’t be a problem as I built these labs using Ubuntu. Cool lab. It was a pleasure to solve it. Many thanks. Thanks for your TSHOOT book and this site. First off thanks for the time and dedication to creating/updating this website, it’s truly appreciated. quick question, I only noticed now, lol, that you have NAT at the top i’m gessing for internet access somehow you wanted us to nat 192.168.x.x to the 209.65.200.225, not sure, but i just leaked a default route to the rest of the network incluing vlan10 on the switches below and this solved my problem (with the exception of adding default information originate to the ospf routers and a null0 route in R1) I also had to force ospf in R4 to redistribute matching external and internal routes. I’m not sure if this is what you wanted, but it works. Only downside is that the ISP knows all the lan routes including my switches vlan interfaces, which is usually not optimal. lol..
You have done great work here. One thing though. What are these static mac addresses that are added to DSW1 and DSW2 configs. Where do they come from and why are they needed? Can the switches not learn them dynamically. In attempting to solve ticket 1, I got lost and after hours, paused to ask what I was doing. I guess I am trying to say it’s easy to get lost into it. Closed everything, and I am going to have another go. Its not working for me…below is the error. the error is shown to you right at the bottom. there is this line for every device in the config but for whatever reason the original file has the same aux port number on at least 2 devices and this config has 15 devices. and so on until you change all of them. should only be 15 of them to change. then open the GNS3 app and click on EDIT>>PREFERENCES and click on Dynamips to left of window. look for the BASE AUX PORT: and change it to start at 2100 TCP. default in windows looks like 2501. Or you can leave this alone and change the numbers in the topology.net file and start the port numbers from 2501 down the line for all devices. Once you have your ios setup in GNS3, place 2 c3700 routers on a blank page and connect them via serial and start them. click CTRL-SHIFT-ESC to open up the windows task manager so you can monitor performance as you now have to set the IDLE PC value. Once you get that done and your cpu drops to 0 or very near it then you are good to go. Note1: It looks like he created this topology under Linux O/S or similar as you will notice in the .net file all the paths have a forward slash /. No need to change anything here because GNS3 recognizes the change and modifies the file. Once you successfully open the lab topology and save it, if you reopen the topology.net file you will see all the paths changed to whats on your PC. Note2: apart from this issue, I find that changing the "working directory for dynamips" helps. click the TEST SETTINGS when you have made your changes. APPLY>>OK. Open up the topology from the lab here and everything should be smooth sailing… hope this helps. Please help tried everything but not working…u can share the topology JPG image with the ip addressing will get the topology build and then import the configs for them.. He even has a video at the end. But thanks again for taking the time to set these labs up! Cheers! any chance of a screenshot of how the FR switch is set up? help pls, i’m experiencing issues loading the lab, getting connection lost, when trying to load the .net file, any clues pls ? Thank you very much for the great lab Rene. But i am facing issue where clients 1 and 2 are not getting ip addresses from DHCP server . I saw similar comments from Polinoma . Can you please help me rectifying this issue . I’m having the same issues like others with Client 1 & 2 not getting an IP address even after loading the Final Config files. It’s a shame as it is a grate lab. I practice the TShoot lab on my real hardware lab but like to have the option of doing the lab while on the road. If you experience issues with the topology esp with aux ports try using ravi p sharma’s topology. After spending 4 days, without reading all the comments above, I finally used that and it worked perfectly!! If only I had seen it earlier!!!! Would also like to add used 3725, it just makes everything so much more simple. have you the video solution pls? any progress on how to solve the issue with importing lab into gns3? I gave up, it could only work if you have exact same physical topology with matching interfaces. Hey, Rene, why don’t you publish the topo image with interfaces shown so that first we can build the right topology and load the equipment with config files. I tried the netbrain to build the topology, but you’re obviously using some tricks to make incorrect so to speak, so netbrain produces some odd output. Thank you very much for your great labs and book. Today i passed the exam with 1000/1000. Does anyone have any ideas about how to solve the "lost connection error". I am tying to open the lab on windows 7 and I keep getting this error. I have downloaded the c3725 image Rene instructed we should download but it does not open. Any help. can anyone answers these questions? 1. What did we create vlan 200. 2. why didn’t we create vlan 10 and 20 on ASW1 and ASW2 ? 3. Do we need to provide IP addresses on Vlan 10 and 20 on ASW1 and ASW2? 4. Do we need to configure EIGRP on ASW1and ASW2 switches? I think the diagram is not clear, it should be. – did you setup the image in gns3 first? -please post all the steps you did in gns3 to try and make this config work..
-what O/S are you using? 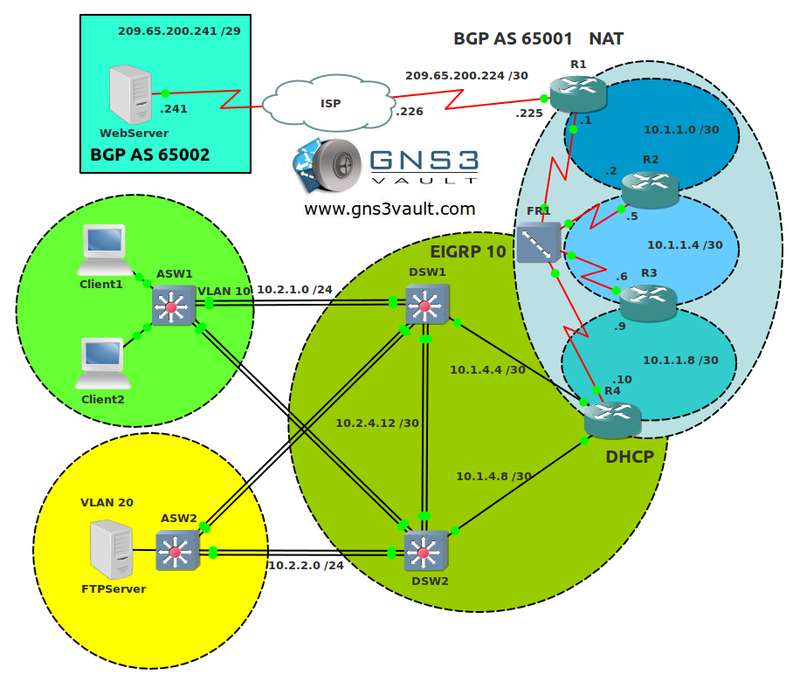 -if possible, take screenshots of your gns3 setup so we can see how you have it setup. without enough information, it is hard to give help. you also need to take a look at the console in gns3, the bottom part of gns3, and copy and paste all the errors that are in there to this site so we can all see whats going on. There are errors in the original topology.net file. Here is a link to replace the one you downloaded with the one I fixed. Just delete and replace with this one. Then as long as you have a c3725 image setup in gns3 it should work. Dont forget to setup IDLE-PC !!! Just start about 3 or 4 routers and wait a minute or two then do the idle-pc. no need to change any other lines. this is because as long as you have the image setup in gns3 and everything else in gns3 is working, then once you open the topology and SAVE, gns3 makes the changes in the file according to what settings you have setup in the gns3 program itself. so, just download the fixed file below..
Once you replace the topology.net file and try to start it for the first time, it will ask you which image to use. Just select the one you saved and after it loads up, save topology in gns3. Thats it !! Thank you very much pcdocta ! After a little bit of hair pulling I finally managed to get this lab up with no errors in gns3. After looking at ticket 1 and trouble shooting it for an hour or so I finally broke down and cheated and looked at Rene’s answer in the TSHOOT book. Well I had already done what was suggested there and it still wasn’t working. I’m noticing a few odd things though on DSW1. I’m not used to looking at an ether switch module slotted in a router so I’m not sure if this is normal behavior or not. I noticed when I do a show ip int bri on this device it says all the vlan interfaces are up but the line protocol is down. So when you try to do a show standby to troubleshoot the next ticket it tells you hrsp is stuck in the init state because the interfaces are down. Also, when looking at device ASW1 I’m assuming that workstations 1 and 2 are plugged into ports f1/4 and f1/5 since the other active ports are used for etherchannels. When I do a show vlan-switch on this device it only shows the default vlans…no vlan 10, 20 or 200. I discovered this when I noticed int f1/4 was in vlan 200 instead of vlan 10 where it should be for the workstation. I thought maybe this was why i wasn’t getting a dhcp address so i had tried to move it to vlan 10 and was informed there was no vlan 10. Anyone else seen this or do i have something incredibly pooched here? The reason why the vlan interface shows down is that fact that with ether module the vlans get saved in a file "vlan.dat" When you load the topology you need to recreate the vlans. I cannot open zip file on my computer. I have same problem as avesimasud above. Its a shame cant get it working as site looks great and would help me finish my CCNP. As I am not the only person experiencing these problems would it be possible to get any definitive advice on how to load the topology into GNS3? [b][/b]I already have the solution for problem with Hyperversor error. Aux: 2001-2012 in your topology and Remember change it in Preference/Dynamips too. I LOVE NETWORKING… I LOVE CISCO…………………. where is the lab download? I am a bit stuck on the 3rd ticket. There is no default route to the BGP network from ospf. I can do a redistribute bgp (I dont think this is a good idea especially if you receive a lot of routes from the ISP. To redistribute all that routes might make the router slow) or using a static route with the default information cmd. There is not specified what is the company policy would like us to do. SVI Vlan 20 and 10 are continuously fluctuating on both DSW1 & DSW2 due to which EIGRP is also fluctuation. Is it a issue or is it due to my Core i5 PC with 4GB of RAM ? Also I am stuck at 2nd Ticket. Any hints ? SYSTEM INIT: INSUFFICIENT MEMORY TO BOOT THE IMAGE! crashinfo, "show tech" and contact Cisco Technical Support. But all routers have same parameters (IOS version, memory size, NVRAM size, Disk0 size) Does anyone experienced this problem? Concerning the errors received on R1 the problem can be solved by increasing the amount of memory to be used by the router from its configuration tabs. Other than that Rene you did a great job by creating such an amazing lab !! I admit there was some useless static routes that I got out of the way, and some frame-relay issues. Where on this webpage, do you find the topology to download? You have to register on this site and login then you will see the topology for download. I’ve been logged but I don’t see the link to the topology. I missed this one during the migration. Just uploaded the files! Where is the PDF to download?? I just added the attachment. Forgot to do this during the migration. I solved this and was reviewing the final configs to see if my solutions were the same. They were not but I’m confident after loading the final configs, there is at least one omission. On R4 you have to redistribute EIGRP into OSPF or there is no route back to the clients. I’m still researching but I still haven’t figured out why both nssa options “default-information-originate” and “no-summary” were needed. For me one or the other worked. Excellent lab….much much harder than the TSHOOT exam and on the exam, you have to use SHOW RUN because debug does not work. If you you resort to SHOW RUN like I did after being frustrated for a day….it’s still harder than the Exam. Are you planing to upload any video solution to all/some Tshoot Labs ? Not working withc3725.bin any alternative ios image?? Pretty much anything 12.4(15)T or thereabouts. 12.4M will work for most non-MPLS, non-DMVPN Phase 3 things too. Great looking lab. I can get the lab to load but if I do a show run I only see the base configs, no addressing or configuration parameters applied to the devices. I am running GNS3 on Windows 7.0. Do I need to do some editing? Very challenging lab, solved it 100%! Even though dynamips is properly path’ed and a new topology works without any dynamips errors. But loading this one does(provide error). Mr. Molenaar, please configure the files to work with the new GNS. great work. 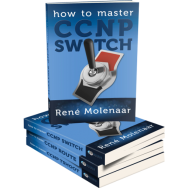 I have your 3 books on CCNP. Really well written. now that problem is resolved but CPU goes 100% with c3725-adventerprisek9-mz.124-15.T14 this image any clue? i am running version gns3 1.2.3 . I am missing links and rx errors that aux con port already in use…. Could you pls advise what u have done to resolve ur connectivity issue. I am also running newer version 1.3.13 and i cant see links either. Hey! Thanks so much Renee. This is a great lab. I rebuilt it from scratch so I would really know the ins and outs in preparation for the big exam next week (TSHOOT). As per a comment I saw on the Packet Pusher Podcast, I am going to use this lab, and have my boss or co-worker go in and break something random a few times each day, so I can tshoot it in preparation! Great stuff Renee! Thanks again. One note: I had trouble pinging past the ISP to the web server, even with converged BGP. I ended up adding a default route on the WebServer router pointing back at the ISP’s WebServer-facing interface. I’m still wondering if I missed something else….oh well. Finally got the lab working in latest GNS3, but really stuck on ticket 1. -I figured out that the dhcp pool in R4 was misconfigured. -I had to cheat and use “show run” on DSW1 to see a bunch of static entries for MAC addresses coming from ASW1 that needed changing. -Client1 doesn’t get a gateway since it’s broadcasting for everything, so “no default-gateway” to get that out of there. -Broadcasts can’t cross subnets, so DSW1 needed to be a relay. put the “ip helper-address 10.1.4.5” command on the vlan10 interface. DHCP is up. Man, this is a good lab. I have the same exact problem. Funny thing is, I could swear it was working fine up until I saved all my configs to start-up config, saved the lab, and reopened later. I’m not seeing anything in the configs between R4 and ISP nodes that could be causing this. I did an ip nat debug on R1 and watched R2 and R3’s addresses get translated when I ping from them, but pinging from R4, nothing shows up in NAT debug. This is really weird, and annoying. It’s stopping anything from the EIGRP side from getting through. Is your area 34 on R3 and R4 set up as NSSA or TOTALLY NSSA? If its just NSSA that could be your issue. I changed mine to Totally NSSA and that fixed my issue. GNS3 management console. Running GNS3 version 1.3.7 on Windows (64-bit). Copyright (c) 2006-2017 GNS3 Technologies. I got it working with the latest GNS3 version. Is this topology still valid for this exam?